ILIGAN CITY, Lanao del Norte - A doctor who volunteered to serve marginalized patients in Sapad, Lanao del Norte was shot dead in the municipality of Kapatagan on Wednesday, March 1. According to reports, an unidentified gunman shot Dr. Dreyfuss Perlas at the back while he was riding his motorcycle on his way to his boarding house in the adjacent town Lala. The attack happened while Perlas was passing Barangay Maranding Annex at around 7:30 pm. Initially, bystanders thought that Perlas was suffering from hypertension and suddenly collapsed on the road. But after noticing that he had a gunshot, Perlas was immediately rushed to Kapatagan Provincial Hospital. In his interview with MindaNews, Kapatagan police chief Senior Insp. Melvin Loquinte said they recovered one empty shell at the crime scene and are currently investigating the motive behind the crime. Prior to his death, Perlas, originally from Poblacion Batan in Aklan province, was a municipal health officer in Sapad. The 31-year-old physician was deployed in Lanao del Norte under the Doctors to the Barrios program of the Department of Health. Even after his contract expired and had the opportunity to fill a vacancy of a needed doctor in his hometown, Perlas decided to stay in the far-flung area after seeing the needs of the community. He recently led the One-Stop-Shop Medical Mission in Barangay Karkum last Tuesday, February 28. Shortly after news of Perlas’ untimely death came out, several doctors mourned the passing of a doctor who chose to serve one of the most remote and disadvantaged communities in the Philippines. Perlas, according to his colleagues, often went out of his way to help his patients. In several instances, Perlas would shell out money for ambulance and other fees his patients couldn’t afford. “Our rural poor communities are in desperate need of doctors. Dr. Perlas was a rarity, having both the competencies and demeanor suited for a career in public health. 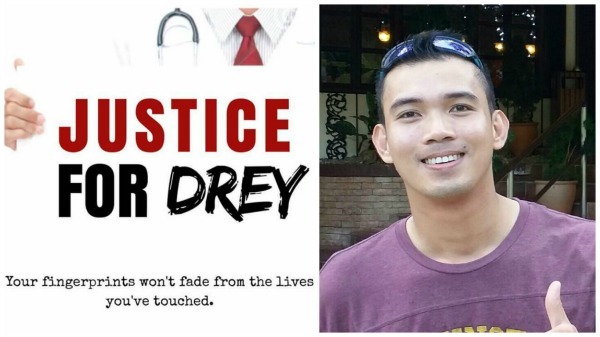 People like Drey represent an immense value to our society, and the compensation he received for this is a bullet to the heart,” Dr. Jorrel Valdez wrote on Facebook. “Your goodness could not protect you so I call on Justice to avenge you. May it be swift. If the laws of the land cannot satisfy, may Divine retribution satisfy tenfold! Doctors who choose to go into rural service away from their comfort zones are rare; but among doctors your kind is far rarer,” Dr. Jordan Pinzon said.